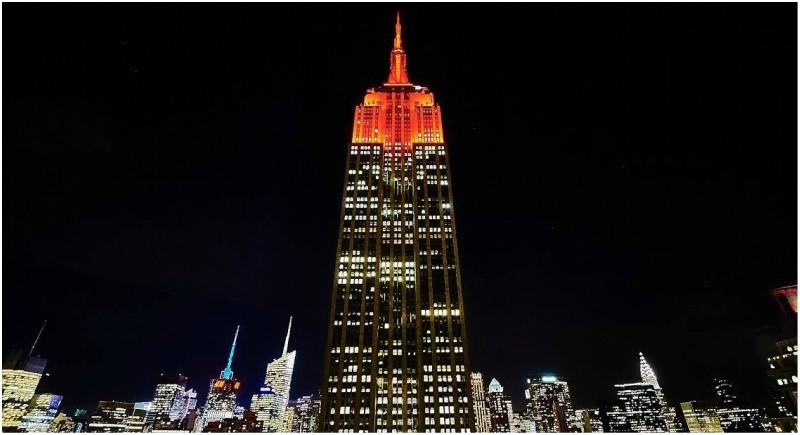 Washington, November 9: For the first time, the iconic Empire State Building in New York City was lit orange in celebration of Diwali. The world famous structure turned orange last night as Indians across the world celebrated the festival of lights. The Federation of Indian Associations (FIA), the largest non-profit umbrella organization in the tri-state area of New York, New Jersey and Connecticut of the Indian community, lit up the monument in a special ceremony. It was organized by the FIA in cooperation with the Empire State Realty Trust and attended by key members of the Indian diaspora. On Wednesday, The United Nations Postal System has issued stamps with 'Diyas' lamps to mark the celebration of Diwali. Syed Akbaruddin, India's Permanent Representative to the United Nations, in a tweet yesterday thanked the United Nations for the gesture. Stamps are available at the UN headquarters post office and online. The stamps are in the $1.15 denomination, which is the basic rate for international airmail letters.